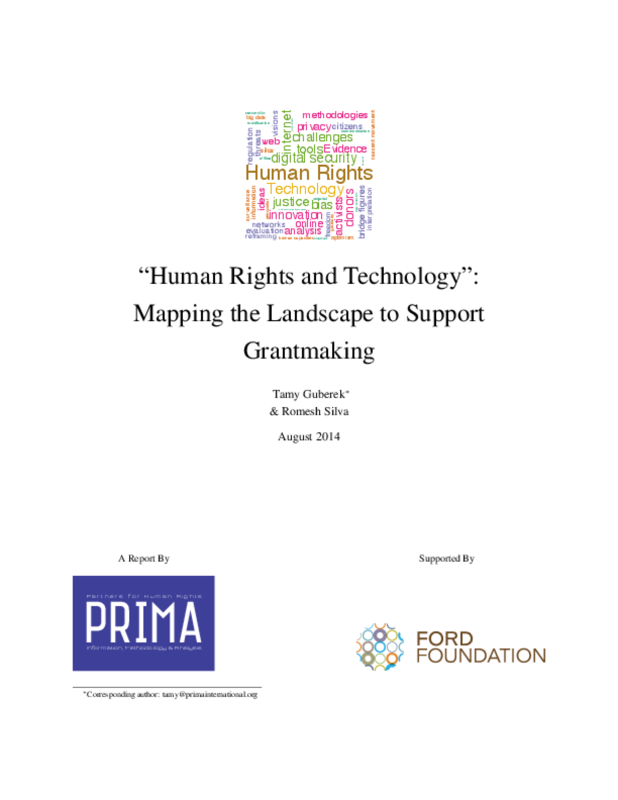 This study was commissioned by five leading foundations to inform donors' thinking and funding in the overlapping space of human rights and technology. New technologies, especially access to the internet, are transforming the landscape of the international human rights movement. The Ford Foundation, the John D. and Catherine T. MacArthur Foundation, the Open Society Foundations, the Oak Foundation and Humanity United, seeking to make strategic investments to harness technology in the service of human rights, face choices about priorities and opportunities for strategic collaboration as well as risks and challenges in this rapidly changing field. This study shows how the HR-Tech space encompasses technology both as infrastructure on which rights in the digital and the physical worlds depend, and as instruments that can help make human rights defenders and their work more effective and secure. Many HR-Tech discussions focus too narrowly on the challenges related to the development and application of the technology itself. Instead, the study identifies broader areas of HR-Tech work that should be at the center of strategic visions and projects. These include building global alliances; developing norms; improving the production, management and analysis of evidence; enhancing cross-sector collaboration; and thinking about technology deployment and adoption early on. Donors who fund HR-Tech work will be more effective with a comprehensive understanding of this broad landscape. They can also support each other and the broader field by sharing knowledge from their current initiatives and past lessons for effective advancement of human rights in the new technology landscape. Copyright 2014 Partners for Human Rights Information, Methodology &, Analysis (PRIMA).